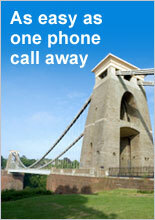 Looking for business services in the Bristol and Bath area? Fed-up with trawling through Business Directories, Yellow Pages or Thomsons and not knowing which companies are any good? We can help. For personal recommendations call us now. We believe that helping people looking for a service (and putting them in touch with companies that provide a high quality service) will over time help to promote worthwhile businesses and good business practice in the Bristol and Bath area, which is in the interest of the business community. There is a practical limit to the quantity of enquiries we can deal with on this basis, so at certain busy periods you may find it difficult to get through to us. This is a free service, and if you are happy with the results, please recommend us to your contacts and friends.